Most recently known for its Nio EP9 electric hypercar, which clocked a Nurburgring Nordschleife lap time of just over seven minutes, NextEV has followed up that act with an autonomous, fully-electric vehicle done in a different flavour. The Nio Eve concept is a hatchback with a pair of (rather large) sliding doors, which aims to offer a wide aperture to its interior thanks to the absence of B-pillars. The study appears to be a six-seater with an unconventionally spacious design, one which dispenses with the traditional driver controls such as a steering wheel. Vehicular control is managed by NOMI, the onboard artificial intelligence engine with touchscreen glass interface. The AI also functions as a ‘digital companion’, which will customise its occupants’ entertainment and preferences. The company calls the Nio Eve concept a robot on wheels, making it clear that the concept’s aim is one of hospitability. The Eve’s front seats are accessed from the main cabin, and is equipped with displays on the active glass when non-autonomous (read: manual control) driving is required. Nonetheless, the automaker says the concept has been developed for autonomous operation from the outset. No specific details are available, though NextEV states that it aims to have autonomous electric vehicles available in the US market by 2020. Meanwhile, the China-based company has been reported as receiving funding valued at up to US$600 million (RM2.65 billion), the investment being led by Chinese search engine giant Baidu. 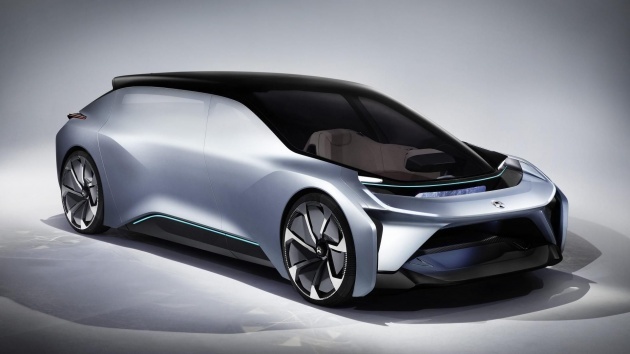 Yes, this Nio Eve concept will replace our ER-3 when it is going commercial. Please don’t wake me up bcos I’m dreaming of it now hence “driver-less”. He he he. It seems like the rear passenger can sleep well if it comes with a good headrest.